"New Regulations for the safety of bicyclists. A man with red flag must precede all horsemen" (Punch, 9 May 1896, p.225). This was the first drawing by Jack Butler Yeats (1871-19 57) to have been accepted by the magazine. Described as a "parody on the progress of civilisation which has an element of pathos" (Pyle 41), it was also one of the last drawings of this kind to carry Yeats's real name. The artist brother of the poet and playwright W. B. Yeats, he appeared regularly in the pages of Punch from 1910-1941, but under the pseudonym of W. Bird. Hilary Pyle suggests that the subtle sense of humour he showed here spoke of the sympathy with humanity which permeated and distinguished his later paintings (41). 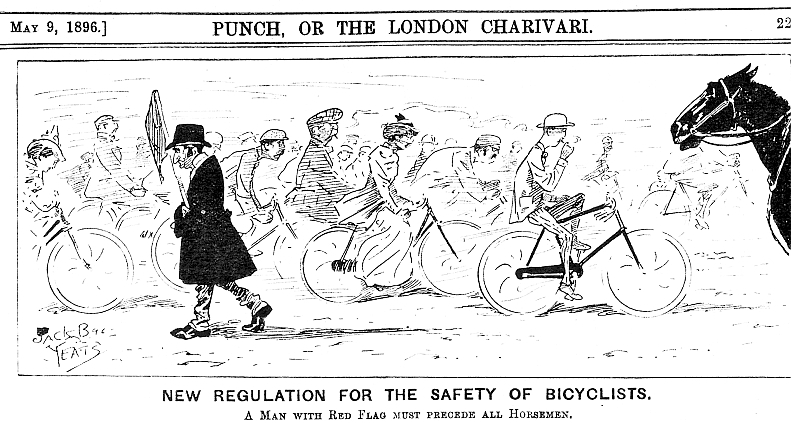 Of course, this cartoon also shows the huge popularity of cycling. H.G. Wells published The Wheels of Chance: A Bicycling Idyll in the same year (1896). Pyle, Hilary. A Biography of Jack B. Yeats. New York: Barnes and Noble, 1989.